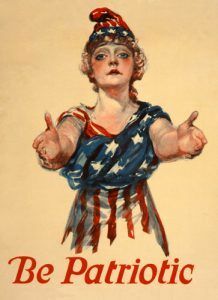 Poster by Paul Stahr, 1918. Available in photo prints HERE. Or as an 11×17 Poster HERE. But what do we mean by the American Revolution? Do we mean the American war? The Revolution was effected before the war commenced. The Revolution was in the minds and hearts of the people; a change in their religious sentiments, of their duties and obligations…This radical change in the principles, opinions, sentiments, and affections of the people was the real American Revolution. — John Adams, 2nd U.S. President. Our new Constitution is now established, and has an appearance that promises permanency; but in this world nothing can be said to be certain, except death and taxes. — Benjamin Franklin, American Statesman, Scientist, Philosopher, Writer and Inventor in the 18th Century. 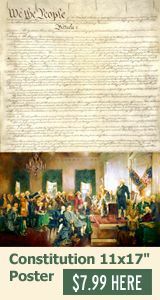 The Constitution of the United States was made not merely for the generation that then existed, but for posterity — unlimited, undefined, endless, perpetual posterity. 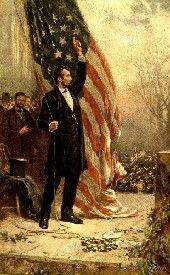 — American Statesman and Politician in the 19th Century.